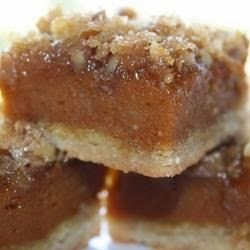 These are exactly like lemon bars but made with pumpkin instead of lemon. it will become a new tradition every Thanksgiving! Beat 1/2 cup butter, 1/3 cup sugar, and 1/4 teaspoon of vanilla extract together until blended. Mix in 1 cup flour until no longer dry. Press into a 9x13-inch baking dish. Bake in the preheated oven for 10 minutes. Remove and allow to cool for a few minutes. Reduce the oven to 350 degrees F (175 degrees C). Whisk together 1/3 cup flour, the baking powder, and salt together in a bowl; set aside. Beat the eggs, brown sugar, pumpkin, 1 teaspoon vanilla extract, and the pecans together in a bowl until the pumpkin is smooth. Stir in the flour mixture until just incorporated and spread the batter over the parbaked crust. Place 1 cup flour, 1/3 cup sugar, and 1/4 cup of cold butter into a bowl. Press the butter into the flour using a pastry blender or fork until no pieces of butter remain and the mixture resembles coarse crumbs. Sprinkle evenly over the pumpkin batter. Bake in the preheated oven until a toothpick inserted into the center comes out clean, 25 to 30 minutes. Cool completely in the pan. Cut into bars before serving.